Money is important. After all, there are bills to pay, things to save for, children to take care of, and all of that costs money. So of course you care about making good financial decisions. But what you really want is to be able to do the things you like to do and not feel burdened or stressed about money when you do them. In other words, you don’t really care about money all on its own. You simply want to get to a point where money doesn’t stress you out or stand in the way of the life you want to live. The New Family Financial Road Map is a great start in that direction. It lays out all the practical aspects of a good financial plan in an order that makes sense. If you follow those steps, you will put yourself in a good financial position. But following those steps isn’t enough to make you happy. Because those steps don’t account for the life that YOU want to build. 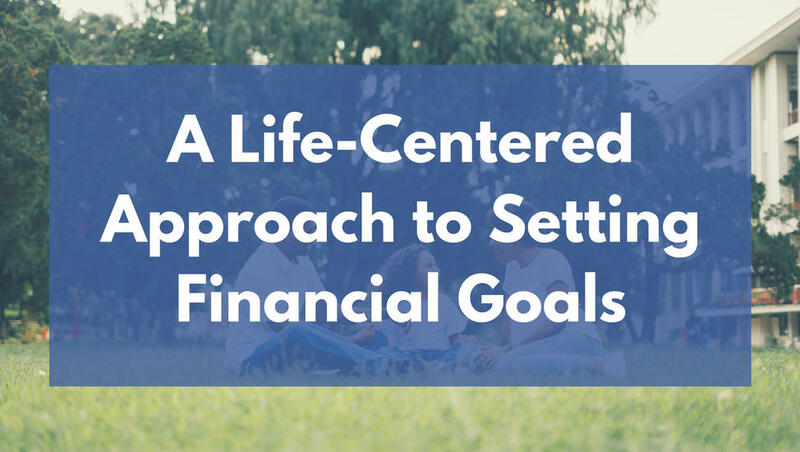 If you really want to use your money purposefully to build a better life, you’ll have to figure out what it is you actually want from life and how to set financial goals that get you there. Here’s an 8 step process for doing just that. Take 15-30 minutes to sit by yourself, uninterrupted, and imagine that in the near future you’re living a happy life. Not 40 years down the road when you’re old and gray, but a few years from now, maybe just five years down the line. Where are you? In the city or in the country? In a house or an apartment? What does the surrounding neighborhood look like? What does your family-life look like? Are you married? Dating? Do you have children? Have you adopted? What do you do together for fun? What does a regular day in your house look like? Who are your friends? How often do you see them? What kinds of activities do you do together? What are you doing for work? What kinds of projects are you involved in? How is your work helping to make the world a better place? How much time do you spend working? What are your hobbies? How do you relax? What keeps you energized and excited? Could any of these side projects turn into a business venture? Let your mind wander as you ask yourself these questions. Don’t set limits or label anything as “unrealistic”. Think only of what a happy life looks like to YOU. A couple of days later, after you’ve let those thoughts settle in and gone back to your regular routine, repeat the exact same process again. This time, write things down as you think of them. Anything that’s part of the picture you form in your head should be put down on paper. This is the list that will eventually turn into goals. Now it’s time to put this list into some kind of priority order. You need some way of determining which goals are most important and worth working towards first. So number each item or group them as high, medium, and low priorities; whatever works best to help you get some sense of which parts of your vision are most important to you. Ideally, your spouse or partner has gone through the first three steps as well and now the two of you can come together and talk about it. If you have older children, you should consider bringing them in on this discussion as well. This is a really fun process. After all, you’re talking about the life you want to build together and all the possibilities involved, and that’s exciting! If at any point this conversation starts to feel like a chore, drop it and come back another day whenever everyone is in the mood. But it can also be a tough process. No matter how much you love each other, you’re still different people and it’s only natural for you to have at least slightly different ideas for what you want out of life. And those differences can cause some conflict. Focus first on anything you have in common. These will be great goals to prioritize first. For any goal that your spouse or partner has and you don’t, just try to hear WHY it’s important to them and leave it at that. Listening and understanding is the first step. You will be re-visiting this process again in the future, so if there are goals or plans you really disagree on I would simply leave it for now. Focus on the priorities you both think are important as a way to get started. This is one of my favorite steps. It’s obvious that it is important to set priorities, but it’s just as helpful to determine the things that AREN’T important to you. By acknowledging that something isn’t important, you can intentionally take time, money and energy away from it so that you have more of those resources to focus on things you DO care about. For a personal example, a few years ago I finally admitted to myself that I no longer cared about sports as much as I used to (may sound silly, but this was a hard thing to admit). That meant that I no longer felt like I needed ESPN, which meant that I could cut cable without really missing anything I truly valued. That freed up some money each month that we now put towards travel, making it easier to visit my family that lives 1,500 miles away. I never would have been able to do it if I hadn’t intentionally acknowledged that watching ESPN was no longer part of my life vision. Shifting expenses away from things you DIDN’T envision as part of your ideal life will give you more money to put towards the things you DID envision. Basically, it’s a way of taking a vague goal and turning it into a clear one so you can take real action to accomplish it. For example, a vague goal might sound something like this: “I want to buy a house in a few years”. That goal is just isn’t specific enough. There’s no way to know exactly how to get started and there’s no way to clearly measure your progress along the way. But you could turn it into a SMART goal by re-wording it to something like this: “I want to have $30,000 in a savings account for a down-payment on a house in 5 years”. Now you have a specific dollar amount as your target, a specific timeline, a specific purpose, and a specific place you’re going to save the money. You can work backwards from there to figure out exactly how much you need to be saving AND you can figure out exactly what kind of progress you’re making along the way. You can do all the planning in the world, but until you start taking action none of it will mean anything. And the truth is that this is usually the scariest step. Taking action opens the possibility of making all kinds of embarrassing mistakes, and the fear of making those mistakes keeps people from taking action. So let me spoil the surprise: you WILL make mistakes. We all do. I’ve made plenty of them myself, some more than once, and continue to do so. It’s just part of the process. So the best you can do is acknowledge that mistakes will happen, take action anyways, and when you do make a mistake simply do your best to learn from it and keep moving forward. This is not a one-time process. Your life will change. Your goals will change. And it’s important to acknowledge those changes so that you’re always working towards your current vision of your ideal life. Once every year or every 6 months, re-visit this process and update your vision. What Are YOUR Biggest Goals? It might sound kind of corny, but the goals you set above are the key to your financial success. Because when you have a clear idea of what you want out of life, you can use your money purposefully to get it. So, what are your biggest goals? Let me know what you’re working towards in the comments below. I can’t wait to hear! Starting with looking at your ideal life is seriously life changing when it comes to setting financial goals. When I went through this exercise for last year, I came up with things like learning mandarin, paying for my kids education (or at least most of it), traveling a lot more than we currently do and a lot of other things that I hadn’t necessarily quantitified and made a lot more progress. I’ve done even better for 2017 putting them in my regular monthly budget. That’s great that it’s been so helpful for you! To me, doing more of what you enjoy is really the whole point of being smart with your money, which is why I find this exercise so helpful. Love these! I am big on visualizing. You really can manifest what you want. Thanks for these!